On a wintry evening in 1860, textile workers in the huge Pemberton Mill in Lawrence, Mass., heard an odd rattle followed by a long, ear-splitting crash. Part of the building’s brick wall bulged and exploded, and then within seconds the mill collapsed. Tons of machinery fell through disintegrating floors, bringing screaming millworkers with them. The collapsed building formed a pyramid 50 feet high, the Boston Journal reported. The moans and cries for help of those in the ruins whose lives had not been immediately crushed out, mingled with an alarm rung out by the factory bells, called almost the entire community to the spot. Darkness lent additional horror to the scene, for while a thousand hands were ready to rescue it was impossible to know whence the calls for assistance came. 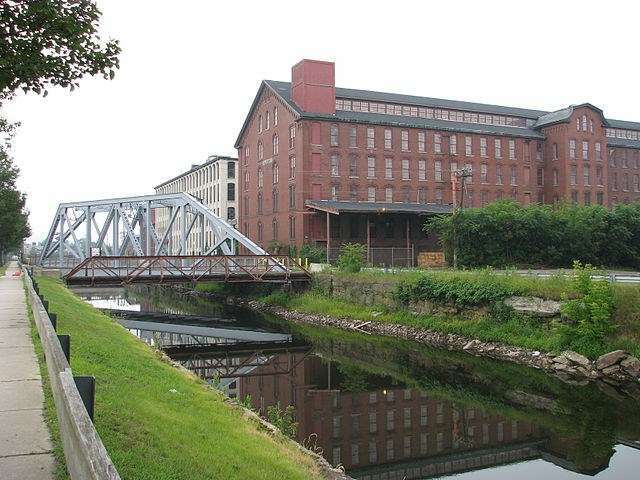 The Jan. 10, 1860 collapse of the Pemberton Mill was the worst industrial accident in Massachusetts history, rivaling the Triangle Shirtwaist fire 50 years later. Between 90 and 145 people were killed, and another 166 injured. The Pemberton Mill was built by John Lowell and his brother-in-law, J. Pickering Putnam. It was five stories high, 280 feet long and 84 feet wide. It cost $850,000 to build, a fortune. The mill was built by the Essex Company under the supervision of Capt. Charles Bigelow, a highly regarded engineer. In Lawrence he had built a dam and canal, a machine shop and mills. The partners crammed more heavy machinery into the building to increase their profit. 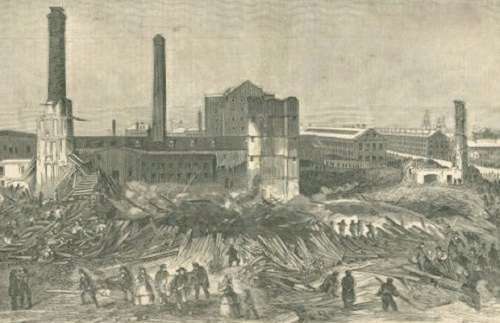 At the time of the disaster, the mill held 2,700 spindles and 700 looms. It earned the owners $1.5 million a year. The mill collapsed with 800 millworkers, mostly women and children, working inside. They were Yankees from Maine and New Hampshire and recent immigrants. More than half had come from Ireland during the potato famine, but natives of Scotland, Germany and Switzerland also died. Dozens died within minutes of the factory's collapse. More than 600 agonized workers could not escape the wreckage of twisted iron, smashed bricks and splintered beams. George Howe escaped before the building collapsed. Rescuers took more than 200 people out of the building using ropes to move beams and pillars. The rescuers called out to the trapped workers and gave them water, coffee and encouragement. Around 10 p.m. two men climbed through a crevice with lanterns to rescue a young woman. One of the lamps broke. The flames raced across the cotton waste and wood, some of it soaked with oil. The Boston Globe reported 14 people were burned to death in front of their loved ones, who could do nothing to help them. One man cut his own throat rather than burn to death. He survived, but later died of other injuries. By midnight the screams of the trapped and burning victims fell silent. Many of the bodies were mangled beyond recognition. They were laid out in a large room on an upper story of Lawrence City Hall so their friends and family could try to recognize them. Every church in Lawrence had parishioners to console, including Baptists, Catholic, Congregationalist, Episcopalian, Methodist, Presbyterian, Unitarian and Universalist. Many families who lost their wage earners fell into poverty. After the disaster, Jesse Glover, overseer of repairs, testified he always thought the building weak, with its thin walls and huge windows. John B. Tuttle, superintendent of brickwork, told architect Charles Bigelow he thought the walls insufficient. A jury found Charles Bigelow responsible for the collapse because he allowed malformed cast-iron columns to support the structure. Bigelow claimed he didn’t know of any problems with the pillars. The original owners, he said, bought the building materials and approved their use. Bigelow did not go to prison; in fact, no one received any punishment for the preventable disaster. Modern analysts also found the owners crammed too many heavy textile machines onto the fourth floor. After the Pemberton Mill collapsed, the owners completely rebuilt it. The mill still stands today. To see a documentary, The Case Against Capt. Bigelow, click here. You can take a self-guided walking tour of the disaster site. Click here. This story about the Pemberton Mill disaster was updated in 2019.